The objective of this article is to provide information for cleaning floor tile grout as it concerns deep cleaning and restoration of the grout. Heavy cleaning floor tile grout can be very difficult in most cases, mediocre and inconsistent results are usually the norm. There are many variables to consider before the actual cleaning process begins. More importantly there is a critical question to ask, if you are not familiar with the floor, has floor finish ever been applied to the floor and grout? This one key question will help with scheduling additional preparation tasks before the heavy floor cleaning project starts. If the floor/grout has a floor finish on it, the floor will have to be thoroughly stripped. If the floor/grout has had floor finish on it in the past, the floor and grout should be thoroughly inspected ensuring complete removal of any old floor finish before heavy cleaning floor tile grout is started. If any floors finish remains in the grout the heavy cleaning process will produce a splotchy appearance. 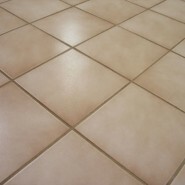 There are two methods for heavy cleaning floor tile grout. The first outline is a heavy cleaning process for a floor with hard to remove sealers/floor finish. The second outline is a cleaning process for a floor that has no sealers/floor finish on it (bare floor). The process must be precise; it involves proper chemical, dilution, brushes and equipment. The heavy cleaning process below will outline cleaning a 500 square foot floor using hand-held equipment. For large floor areas an automatic scrubber can be used to save time and labor. Thoroughly remove all floor finishes using manufacturers recommended procedure. Perform heavy cleaning floor tile grout using the following tools and cleaners. Flood mop floor with cool clean water (bucket and mop 1). Evenly spread TexSpar silica onto floor surface (clean approximately 50 square foot section at a time). Work water and TexSpar together onto floor and grout using swing machine and Flo-Pac scrub grit brushes, making 3-4 passes in each area is in most cases sufficient. Using wet dry vacuum pick up TexSpar solution. Flood rinse floor with cool clean water (bucket and mop 2). Using wet dry vacuum pick up rinse water. Damp mop the floor with cool clean water (bucket and mop 3). When emptying old solution out of wet dry vacuum, use drain screened frame to catch silica from going down the drain, then dispose silica in trash dumpster. In one mop bucket mix a 4 to 1 dilution of Suma Breakup Degreaser, 4 gallons water 1 gallon Breakup Degreaser (mop bucket 1). Flood mop floor with Suma Breakup Degreaser (clean approximately 50 square foot section at a time). Work Suma Breakup Degreaser onto floor and grout using swing machine and Flo-Pac scrub grit brushes, making 3-4 passes in each area is in most cases sufficient. Using wet dry vacuum pick up Suma Breakup Degreaser solution. Flood rinse floor with neutralizing solution (bucket and mop 3). Using wet dry vacuum pick up neutralizing solution. Damp mop the floor with neutralizing solution (bucket and mop 3). As with any project cleaning task, results are only as good as the crew performing these tasks. There are too many expectations of a cleaning staff to do the impossible; these sometimes impossible expectations originate from the customer or companies they work for, putting the onus on an untrained cleaner. In order to achieve desired results and save future time and money train the crew, teach them how to become efficient and the professionalism and goal/quality oriented result will be realized. Walter G Legge Company, Inc.